The private Dartmoor Railway line between Okehampton and Meldon, a little way to the west, provides a pleasant and easy way to access this part of Dartmoor. The railway line is accompanied the whole way by a cycle route, the Granite Way, and by using this easy access route to Meldon and walking back along a slightly more circuitous route over the edge of the moor, an attractive and interesting walk can be followed. Okehampton is served by buses to and from Exeter, Plymouth, Bideford and Barnstaple. In addition on Sundays there is a Dartmoor Railway service to and from Exeter. Dartmoor Railway trains between Okehampton and Meldon operate daily in August, five days a week in June, July and September and at weekends in June, July and September and at weekends October to April. There is plentiful car parking at Okehampton Station, which is well signed from the town centre and approach roads. Okehampton : all facilities; Okehampton Station : refreshments, toilets; Meldon Station : refreshments, toilets (both seasonal). 1 stile; one steady climb of 160m/530 feet [although steady, never especially steep]. Okehampton station is positioned at the very top of the town. There is a pleasant signed walk through the park from the town centre, although it does involve a climb of some 60m/200 feet, Alternatively, most buses call at the station on Sundays and there is plentiful car parking. The station was in a state of semi-dereliction until the 1990s. It was then acquired by Devon County Council which, in partnership with a range of local authorities and companies, including Dartmoor Railway, renovated the station in the style of a provincial Southern Railway station of the 1950s. The lane is marked with the National Cycle Network Route 27 sign, and also signed as the Granite Way. Cycle route 27 stretches across Devon between Ilfracombe and Plymouth. The Granite Way is the name given to the largely off-road section of route 27 around the edge of Dartmoor. Route 27 and Granite Way signs guide the whole way between Okehampton and Meldon. Next to the railway there is a cleared area and next to this is a collection of huts for the Air Training Corps and the Army Cadet Force. This is the location of the old military sidings, the nearest point on the railway to the large military Okehampton Camp on the moor above, to be passed later in the walk. In times past men, munitions and ordnance would have been loaded and unloaded in vast numbers. 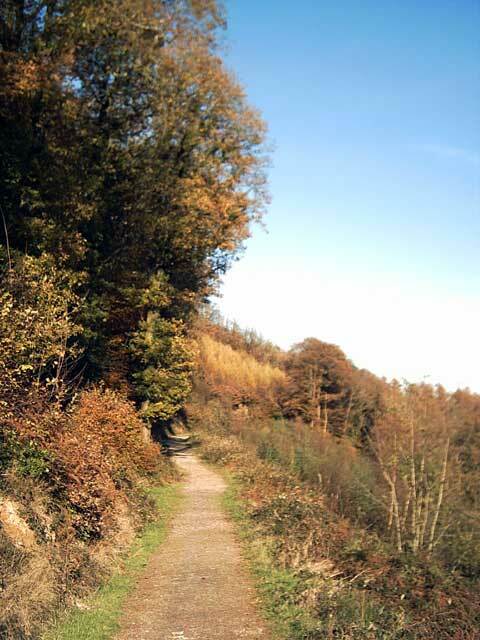 Along the walk you will see a splendid view of Okehampton Castle. The Castle was begun shortly after the Normal Conquest of 1066. It commanded views of the surrounding countryside and controlled the road to Cornwall. The Castle has stood as a ruin since 1538 when Henry VIII ordered it to be demolished as a punishment for its owner’s treason. It is now maintained by English Heritage. The area surrounding the castle, including the Granite Way and beyond, once formed part of Okehampton Deer Park. This was established by the Earls of Devon when they owned the Castle to guarantee good hunting. They cleared former settlements and established harsh laws to prevent poaching. The A30 Okehampton by-pass was built between 1985 and 1988, after some controversy over its route. The tunnel was constructed for agricultural access, allowing local farmers to take stock from one side of the road to the other safely. At Meldon Quarry notice the steps on the right leading up to “Emmett’s Folly”. These lead to a good viewpoint over the quarry workings. Beyond there is a viewpoint over the A30, both the old road which is alongside the buildings in the middle distance, and the new one at the foot of the slope. On the skyline to the left the new road can be seen climbing over Sourton Down, the highest point on the A30 between London and Land’s End. Emmett’s Folly is named after Roger Emmett, the County Council engineer who successfully (eventually) planned the path over and around the quarry spoilheap which now forms the viewpoint. There is an information board explaining the geology of the area and gives some background to the Dartmoor Railway along the walk. The quarry was opened in 1895. It produced hornfels, a very hard rock, which was important as ballast for the railway lines. It became the major source of ballast for the London and South Western Railway. It continues to produce ballast, and also roadstone, up to the present day, and the retention of the railway is due to the existence of the quarry and the desirability of moving much of the stone by rail. 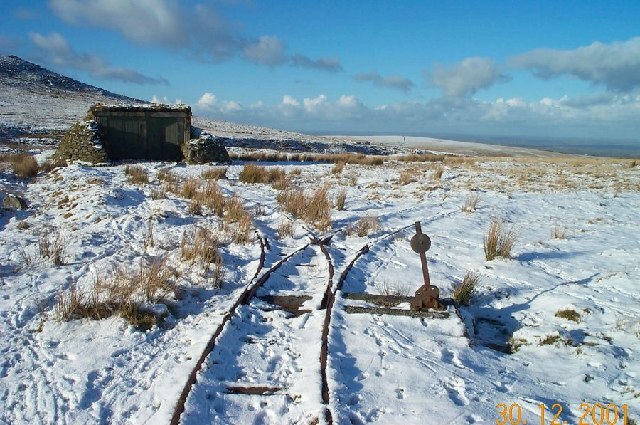 This new station was established for the Dartmoor Railway in the 1990s. Like the station at Okehampton, it is painted in the traditional Southern Railway green and cream. Over the railway, old quarry buildings house displays of historic photographs and equipment associated with the quarry and the railway at Okehampton and Meldon (open seasonally). The Viaduct was built in 1874 as a single track span. It was added to in 1878 when it became double track. It is one of only two of this design which was ever on the mainline rail system. This line was, in fact, the old Southern Railway mainline between London and Plymouth and was, in its day, as prestigious and as quick as the better-known Brunel Great Western Line. It was closed in the 1960s as part of the Beeching cuts when it was considered an alternative route between London and the far west was not needed. The Viaduct, and several miles beyond, now form part of the Granite Way. 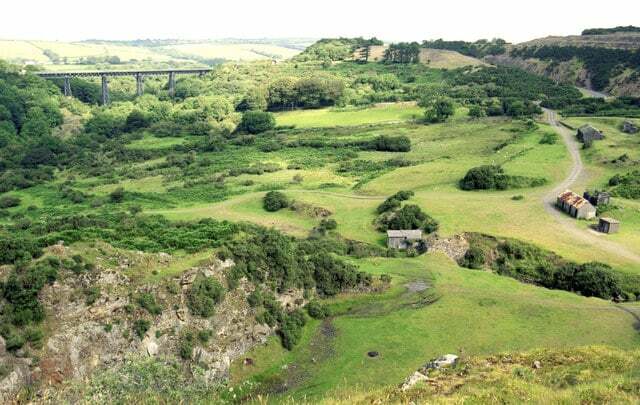 While you should go onto the Viaduct for the superb views of older quarries below and of Meldon Dam, built in 1972 to form a large reservoir behind, our walk now leaves the Granite Way. Meldon Aplite Quarry was worked from the 1800s until 1970 for aplite or granulite, a hard form of granite used for roadstone. It was also used to manufacture glass, and at this point in the 1920s was a relatively short-lived glass works. There are examples of the bottles made in the museum in Okehampton. The attractive moorland valley is that of the Red-a-Ven Brook, the stream flowing down over a series of small waterfalls on the right of the path. As the path rises there are remains of further quarry workings and overgrown spoil heaps of the 19th century Red-a-Ven copper mine. The series of red and white posts mark the edge of the Army’s Okehampton Firing Ranges. If live firing is taking place, red flags will be flying from prominent hilltops. Make sure you do not stray beyond the posts. The stone wall largely coincides with the boundary of the Okehampton Deer Park, mentioned earlier. Today its use is as the boundary of the Meldon Quarry area. As the path, and the wall, continue to rise gently, views to the left over the centre of Devon become ever wider. If the day is clear, the edge of Exmoor can be seen on the far skyline ahead and left. Yes Tor is the second highest point in England south of the Peak District at 619m or 2,030 feet above sea level. The highest point, incidentally, is High Willhays, just behind Yes Tor but not visible from here and just 2 metres higher. The first permanent army camp, Okehampton Camp was established in 1892. It is used to train soldiers on the moor and it is also the base for the annual Ten Tors weekend when intrepid youngsters undertake a two day trek across the moor. Station Wood is largely comprised of sessile oak, typical of woodland on the fringes of Dartmoor. At the other end of the wood is a small reservoir, built to supply the water tanks at Okehampton Station which were used to top up the water in the steam locomotives. The hostel, on the right, occupies the former goods sheds of Okehampton Station. It was converted to a Youth Hostel in the 1990s.